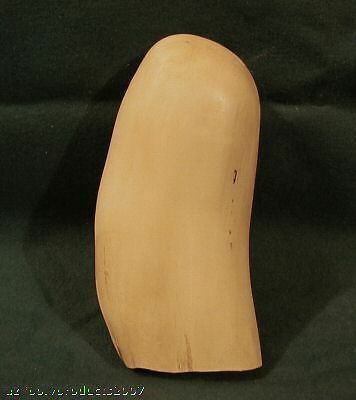 THIS listing is for: ONE Custom Made Faux Ivory Whale Tooth. The tooth is NOT real. It is a COPY of a real tooth. The original tooth was harvested long before the ban on whaling and no living whale was harmed in the cloning of this tooth. The dimensions of the tooth are 6 x 2 3/4 x 2". NOTE: THE MASTER IMAGE HAS BEEN ALTERED TO SHOW DETAILS. THE ITEM PURCHASED WILL BE OFF WHITE. NOTE EVERY SINGLE FAUX IVORY ITEM I LIST IS MADE TO ORDER AND SHIPPED WITHIN 10 BUSINESS DAYS. FAQ (1) Feedback: Leave it, receive it. You don’t, you won’t. (2) All resin items are hand poured into silicone molds. YOU will do final shaping and sanding. The items are not sold or advertised as final products. (3) All STAG items are hand poured and hand colored. Inconsistencies are just the same as in nature. If you are looking for perfection, sorry I can’t oblige. (4) Dimensions advertised are /- 1/16” AVERAGE. The items are NOT advertised or sold as final products, YOU need to sand, carve and finish them. (5) All Faux Whale Teeth are solid, NOT hollow. All of them reflect gouges, scrapes and are an exact copy of the surface of the real tooth. MULTIPLE PURCHASES DISCOUNTS APPLY.